Allow me to present Jim Raynor's old buddy, Tychus, who in many ways represents the pinnacle of that which we call "Marine." "Aww, hell. It's about time!" Restricted: Requires a strength of at least 5 to absorb the recoil: -5 penalty to Ranged Combat otherwise. Dodge 5, Parry 5, Fort 14, Tou 11/3, Will 2. Ulterior Motives: "And then we'll put a bullet in her head, right partner?" Womanizer: "That Nova. . . You ever think about hittin' that, Jimmy?" Addictions: Tychus drinks, but he's NEVER seen without a cigar. Always Be Prepared: Tychus never seems to take off his powered armor . . . ever. The amusing part about that, of course, is that the relationship between the characters was never established in the games themselves (only assumed in the sequel), and in fact originates from either additional content or just plain background. If I understand correctly, however, Tychus and Jim go way, way back; before the first game. By the time of the Brood War, Tychus would already have been serving a lengthy prison sentence in solitary cryogenics for the things he and Jim did back in the day. At the start of StarCraft 2, Tychus has had little to no direct experience with the Zerg. Tychus is an endless source of amusement throughout the game (I'm thinking of one cinematic sequence in particular after one of the 'moral quandary' plot branches), and an excellent go-to in a fight. He's also an excellent pilot, and is Raynor's top choice when the time comes to steal the Dominion prototype mecha, the Odin. He does lack a lot of Raynor's flexibility, and doesn't have anything like his leadership or people skills. . . but he generally compensates for that with brute force. I'd been meaning to finish SC2 but I'm kinda waiting for this one guy to do it so I'm on hold for a bit there. Regardless the character is interesting and I'll look forward to some of those good bits you mentioned when I do get around to seeing the whole campaign. Here's a tip; if you want the funniest cut scene with Tychus, if you get a moral quandary on a mission, side with the attractive woman. It might be sexist, but it worked pretty darn well for me on my play through, and kept Jimmy feeling on the moral high ground . . . I'm still trying to figure out whether that was an intentional decision on Blizzard's part to present it that way, or if it was complete coincidence. Nice work, just one little note, according to some sources Tychus nver remove the armor since his benefactor rigged it to explode if he ever tries. That's very close, but I was trying to avoid too many spoilers for those who have yet to finish SC2. Call it a hidden element to his complications. OKay, so I've been doing some reading again, and I'm sorely tempted to make it the new direction of this thread for awhile . . .
A brief introduction to the subjects for those who aren't aware of them . . .
Nextwave: Agents of H.A.T.E is a 12 issue comic series from Marvel that ran a few years back, and as I tend to not see things like it until they become trade paperbacks, I missed it until now (thank God for Atop the 4'th Wall). The premise: Nextwave are a group of 5 C-list Marvel heroes brought together by H.A.T.E: The Highest Anti-Terrorist Effort, a C-list S.H.I.E.L.D knockoff. They were recruited to fight Unusual Weapons of Mass Destruction (U.W.M.D.s). The problem? H.A.T.E is funded by terrorists, who basically want to test said weapons on America. Naturally, they go rogue to fight the evil plot, and good old fashioned craziness ensues, with everything from M.O.D.O.C.K.s to dinosaurs to the Dank Dimension to cloned robot broccoli people . . . and of course, Director Dirk Anger, Agent of H.A.T.E. It may be the single most awesome thing I have ever read in any comic-book. Ever. Of all time. Right now, I think that may be my new 'to-build' list. "We never had to deal with anything like this when I was in the Avengers." Electromagnetic Energy Control: Ranged Damage 12 • 24 points. Default energy type is visible light. Force Field: Protection 10, Impervious 9, Sustained • 19 points. Name Issues: Every so often, that upstart Mar-vell will change his name and Monica will have to pick a new one. Glory Days: "When I was leading the Avengers. . . "
H.A.T.E: Her former employers are providing most of the bad guys at no extra charge! Motivation: Doing Good. Also sticking it to H.A.T.E and the Beyond Corporation. And their Broccoli Men, too! 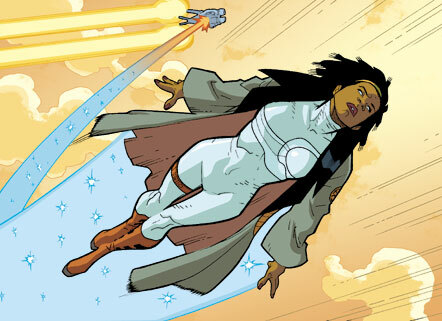 Notes: Monica Rambeau is a character who's gone up and down a lot in power over the years since her debut; Nextwave was set at the beginning of the path back up for her, so I built her at PL 10 with a few extra points to represent how much experience she really has. She was the leader of the Avengers for awhile, highly respected by Captain America (he's the one who recommended her for the job), and is just all around awesome. She's also had to change her name like 3 times because of issues with Mar-vell. Originally known as Captain Marvel, then Photon, then finally just Monica. "Pulsar" is her current official name, but it's not something she used while with Nextwave, or at all really; she tended to just go by Monica. I haven't included the team's vehicle in the writeup because it's a shared resource. That they stole (from H.A.T.E, naturally). I started by using the Energy Controller archetype as a base, tweaked a few details that seemed wrong for her and built back up, but some aspects of her powers are difficult to capture; the likelihood is that she power stunts liberally, even with her variable descriptor. She's been Gamma radiation, X-rays, and normal light, and just about everything else in between, but with the exception of Light they share a lot of common characteristics; the most she should need is to stunt off her Energy Control for afflictions and such. EDIT: Fixed a few issues pointed out by my friendly editor, Murkglow. Last edited by Xarathos on Wed Sep 15, 2010 2:59 pm, edited 3 times in total. Oh yeah, Nextwave. You've got my attention! Last edited by Siskoid on Wed Sep 15, 2010 2:41 pm, edited 1 time in total. Your friendly editor is back with more nitpicks. I'm also somewhat unsure if she is ever depicted in NextWave as having a Force Field but that might be from her other comics which I am not aware or or just an artifact for game use (as she probably needs some kind of toughness booster, well maybe not as she is Immune to alot of damage while Insubstantial...). Anyway that last part is just me thinking aloud and not really critiquing. Regardless I think the build is a good one and I look forward to the rest of the team (she was probably the hardest one to build as she is easily the most diverse of the group power wise... Except for maybe Machine Man). Siskoid wrote: Oh yeah, Nextwave. You've got my attention! Thanks! Enjoy the rest of the builds. Murkglow, thank you as always; made the edits, and the build is a bit cheaper as a result, which is a plus. Even with paying more for the Variable than I was before, heh (though I'll have to look it up and see, I think it might be cheaper than I'm paying now). And yeah, Monica and Aaron are definitely the most complicated as far as I can tell; Monica because . . . well, just look at her power set, and Aaron because he's basically a living Swiss army knife. You're right, the force field is basically an artifact for game purposes; she definitely has SOMETHING that's boosting her toughness in the comics (including NextWave), but it isn't entirely clear to me what that is; in the absence of evidence, I tend to assume it's a force field of some kind. She's not running around with the Stamina of Atlas, so . . . True, like I said that was really more me just thinking aloud and replaying scenes from the comic in my head. And as for the Variabe Descriptor, you might be able to do only 2pp as really your Energy Control and Insubstantial are the only two that really need it, the others probably do not. I was overthinking the issue a bit previously. I figured as much; no problem at all. This thread is very friendly towards thinking aloud! Tweaked the costs again. Thanks as always for your excellent nitpicking, Murkglow. Next up, the explosives expert (of a sort), Tabitha "Tabby" Smith, also known by her ever-so-elegant moniker . . .
"I've handled worse. Tick Tick Tick Boom." Athletics 6 (+6), Acrobatics 6 (+10), Close Combat: Unarmed 4 (+10), Deception 4 (+7), Expertise: Street Kid 4 (+4), Persuasion 4 (+7), Perception 4 (+5), Ranged Combat (Time Bombs) 4 (+10), Sleight of Hand 8 (+12), Stealth 2 (+6), Technology 6 (+6). Mall Brat: Tabby is obsessed with the latest celebrity gossip and which shoes are on sale at the mall right now. Identity Crises: Boom Boom is only the latest in a long line of code-names, and by her own admission, most of them sucked. She still wishes people would call her "Time Bomb," but it's probably for the best that they don't. Trailer Trash: Yep, that's right. People care more about this than about being a mutant. It's funnier, too! Because the 'hate the mutant' game gets old fast. Also, her father? Like, totally a jerk. Hatred: "I hate cops! Because, like, cops keep arresting me and stuff? For stealing? Like stealing's a crime or something?" Kleptomaniac: Tabby will steal all your stuff and probably sell it back to you on Ebay. Then she will steal it again. Enemy: H.A.T.E Especially the robot samurai and the broccoli people. Tabby hates broccoli. Also Dirk Anger. I'll admit freely that my exposure to this particular character comes from about two sources, one of which was X-men: Evolution. The other was NextWave. Despite that limited contact, she remains one of my favorite characters, because every encounter I HAVE had was loads of fun. I did read up on her history somewhat, though, and tried to capture some of it here. 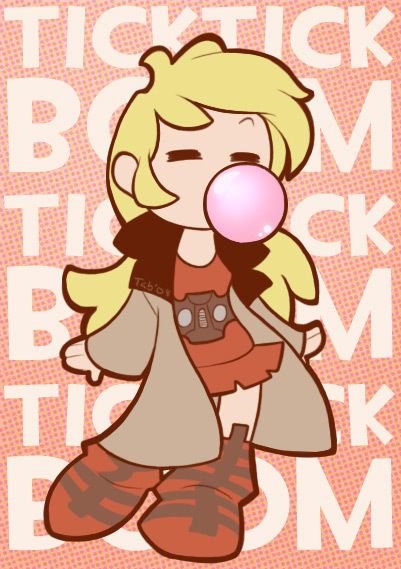 Boom Boom has had about 9 code names over the years, and covering her considerable history as a B-C lister in the Marvel-verse would take far too long, but suffice it to say that she's changed a lot in her time. This represents a return to a far less serious Boom Boom than previous (Meltdown?) and frankly a lot more fun, too. A word on her immunity: Rather than make her explosives selective, I chose to give her a selective reactive immunity that's designed to reflect the way her powers work in the comics a little better; if one of her explosives goes off too close to her or any friends close to her, she can protect them by reabsorbing the plasma. Doesn't help people at the full range of her powers, though. Last edited by Xarathos on Wed Sep 15, 2010 9:53 pm, edited 3 times in total.